Creating inventory list with free templates and examples. Inventory list has never been easier. 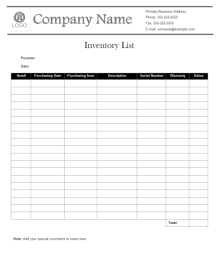 A product inventory list helps you track the items you use or sell with each of the amount listed in a document. It will record how much of a certain item is in stock. An inventory list will be prepared like a business document with proper heading on the top of the page along with the date when updated. With an inventory list you can keep track of how much of the product is coming into your business and how much is going out. Edraw built-in inventory list elements give you a shortcut to make custom inventory lists. Unlike other table makers, Edraw is based on a dragging and dropping method, which makes easier to add company information, set table styles and layout the form. Use it to make professional looking inventory list for your business. 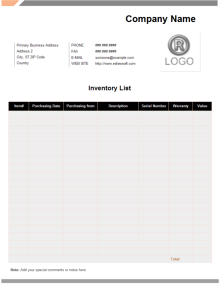 Free download this editable inventory list form and customize for your own use. 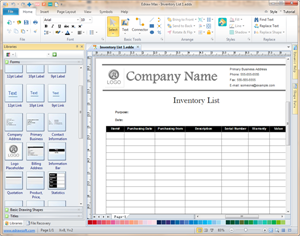 Try this customizable inventory list example instead of starting from a blank page. Make some changes to make it your own style.